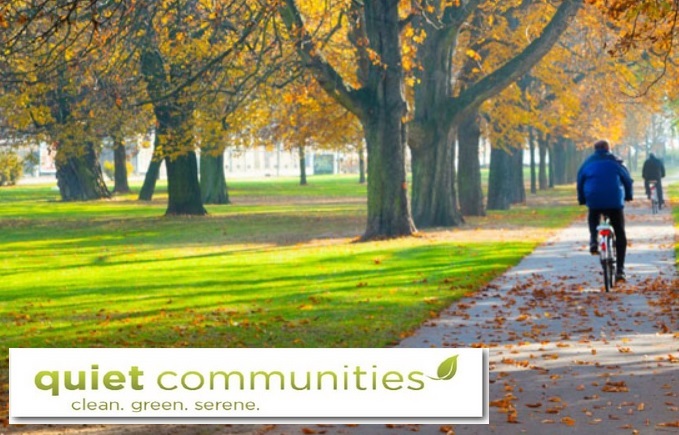 Quiet Communities is a nonprofit organization that takes an evidence-based approach to help communities understand the adverse effects of gas powered outdoor maintenance and find quiet, sustainable, and healthy solutions. Noise from landscape equipment is not simply a nuisance, it is a health hazard causing conditions ranging from annoyance and sleep disruption to cardiovascular disease and hearing loss as well as hyperacusis. It affects not only our physical health and mental health, but also our ability to think and function. Results of studies show that noise exposure is responsible for health problems in tens of millions of Americans at a cost running in the billions of dollars each year (Hammer, 2014; Swinburn, 2015). Landscape maintenance equipment – mowers, blowers, edgers, trimmers, brush cutters – produce 90-115 decibels at point of use. Quiet Communities is working to influence changes to the landscape industry and give hyperacusis sufferers options for influencing change at a local level for these destructive sources of noise. Hyperacusis Research recently met with several members of the Quiet Communities team: David Sykes, Strategic Advisor, Jamie Banks, Executive Director, and Jeanne Kempthorne who are pictured with Bryan Pollard. It seems like with everyone having surround sound, sound bars and speakers with sub-woofer, leads to everyone else having something louder. I hate hearing my neighbors TV so loud I can tell what the content and dialog is and they yell and bang cabinets and have no idea no one wants to hear their fights and stupid shows. Show some common courteous to your neighbors and keep you volume down or get head phones, because ear plugs and head phones cannot keep out the sound your noise and vibration creates.